Graduation requirement is effective as of the 2014-2015 school year. 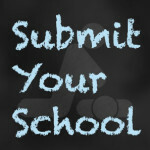 School districts must provide one time cardiopulmonary resuscitation (CPR) and automatic external defibrillator (AED) instruction as part of the health and wellness curriculum at the high school level. CPR instruction must be taught according to current, evidence-based emergency cardiac care guidelines, incorporating psychomotor skills and the use of AED’s. (a) Beginning with the 2014-2015 school year, a public school student in grades nine through twelve (9-12) shall be trained in quality psychomotor skill bases in cardiopulmonary resuscitation before the student graduates from high school. Ark. Code Ann. § 6-16-143, attached to this memo, requires students in grades 9-12 to be trained in the psychomotor skills needed for cardiopulmonary resuscitation (CPR) before graduating from high school, beginning in the 2014-2015 school year. 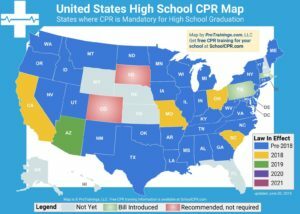 The current Arkansas Curriculum Frameworks for 9-12 Health and Wellness (adopted by the State Board of Education in 2011) include practicing the psychomotor skills used for basic life support and first-aid procedures and offer CPR as an example.